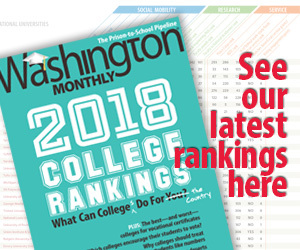 Washington Monthly | Polarization: Policy or Personality? An awful lot has been written over the last few years about how polarized the American electorate has become. Underlying all that is an assumption that the polarization is rooted in policy differences. A recent set of polling questions from HuffPost/YouGov shows that assumption isn’t as accurate as we’ve been led to believe. In a new HuffPost/YouGov poll, we randomly assigned one half of the 1,000 Americans surveyed to say whether they agreed with positions Trump held. The rest were asked whether they agreed with positions held by Obama, Secretary of State John Kerry or current Democratic presidential candidate Hillary Clinton. The trick: the positions were actually the same. This indicates that the polarization we’re seeing today in our politics is a lot more complex than we’ve tended to think, and is perhaps tied as much to personality (or party) as it is to policy. It is similar to the results of polling Obamacare vs the Affordable Care Act. According to a new CNBC poll that surveyed two different groups, 46% of the group that was asked about “Obamacare” was opposed to the law, while 37% of the group asked about the “Affordable Care Act” was opposed to the law. 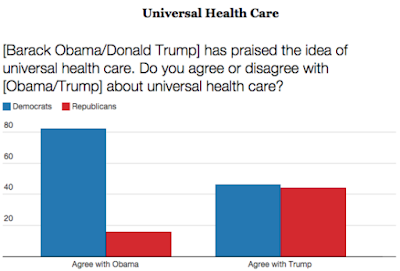 At the same time, more people support “Obamacare” (29%) than those who support ACA (22%.) In other words, having “Obama” in the name “raises the positives and the negatives,” as CNBC put it. The bad news is that demonization of the other side seems to be working to drive us apart. But the good news is that – if we could ever get to the point of actually discussing policy – perhaps we agree more than we think.